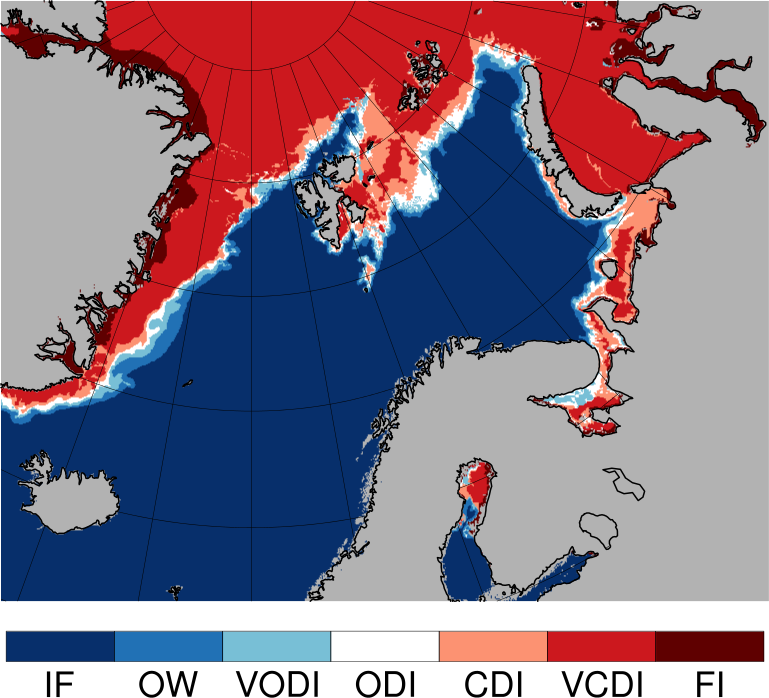 Results for the sea ice edge position is now extended by including the position bias. A positive bias means that the modeled sea ice edge is on the open ocean side of the observed edge. Note that this metric can be interpreted as a proxy for sea ice extent. We now also provide the bias of the sea ice edge. In the validation algorithm, the sea ice edge is composed of a line of grid cells. The new metric thus gives this bias in units of grid cells (presently, each grid cell represent a square of size 12.5 km x 12.5 km). A positive bias means that the sea ice edge is longer in the model results that in the observational data. These web pages contain an outline of the validation algorithm. Download this document for a detailed description of the algorithm, the observations that are used etc. Validation of the CMEMS Arctic MFC results for sea ice concentrations is performed using the ice chart data from the CMEMS Sea ice & Wind TAC. The region for which the ice charts are available, is shown in the sample snap-shot below. Ice charts are available daily, but not for Saturdays, Sundays and public holidays in Norway. The horizontal resolution of the ice chart data is 1 km. In addition, regions with no ice is defined as a separate class Ice Free (IF). Note that our model does not distunguish between classes VCDI and "Fast Ice", so these two classes are also merged into one class in the validation, which will be referred to as Very Close Drift Ice. Note also that for the observational products, classes IF and VCDI have been split according to the distance from the MIZ. Ice chart data are available as aggregated ice concentrations (CMEMS product SEAICE_ARC_SEAICE_L4_NRT_OBSERVATIONS_011_002). Validation of the CMEMS Arctic MFC results for sea ice concentrations described above is supplemented by a validation using the data provided to CMEMS by OSI SAF as the observational reference. This product has a much coarser horizontal resolution than the ice charts, and the model results are not independent of these data. However, in contrast to ice charts, the OSI SAF products covers the entire region with ice infested waters in the northern hemisphere, so results from this validation provide information about the model performance in regions not covered by ice charts. Validation results are provided for Arctic sectors, and (for 2017 onward) for the 13 GODAE regions. OSI SAF sea ice concentrations based on SSMIS data are available as aggregated ice concentrations (from CMEMS product SEAICE_GLO_SEAICE_L4_NRT_OBSERVATIONS_011_001). The model results are produced with the TOPAZ ocean data assimilation model system (CMEMS product ARCTIC_ANALYSIS_FORECAST_PHYS_002_001_a). Presently, TOPAZ is run weekly with data assimillation one week prior to the bulletin date, followed by a one-week 100 member ensemble simulation ending on the bulletin date, and finally a 10 day deterministic forecast. TOPAZ was developed and is maintained by the Nansen Center.